We traced over scaled real pictures of the Desilux air-horns fitted to modern Class 37 engines, to create an acurate 3D design which we print with our Formlabs Form-2 printer in black resin, ready to fit. Similarly for Class 60 engines, we offer the variation on the design of the horn mountings, both with and without the later all-over step fittings. Our step section versions are formed to scale in one piece, compared with Hornby's incorrectly sticking-out separate metal fitting. For Lima models these air-horn options are a big improvement on the artistic impression of twin joined horns. Sometimes covering caps were applied to the real life horn ends - we model the concave open ended horns which you could easily fill with a thick paint daub to represent covers. 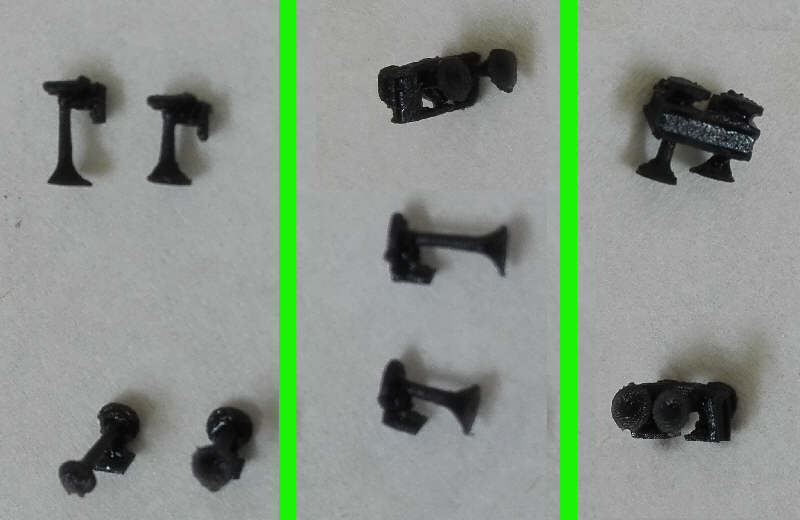 Each class type is available in packs for 4mm OO-scale, or 7mm O-gauge, as a set of four horns for one engine. Below a comparison of our 4mm horns on the left (note the concave ends), with factory model horns from Bachmann (middle set with erroroneous lug support) and Vi-Trains (left oval ended pair). Ours are to scale and being so fine need careful handling just like the original parts. There are over-scale flat-ended more robust brass replacement horns available elsewhere. No spares have been made available from Bachmann. Stepped set, the revised versions with the step brackets for both ends.